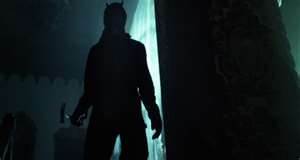 This weeks Gotham starts ten years before with a madman putting a creepy mask over his head saying he is the spirit of the goat. Bullock and his then partner are on to a man called Randall who they suspect as the serial killer of three people they are hunting. They find him in a warehouse with another victim and his partner is attacked. Bullock takes aim at Randall who says he will be back no matter if his body fails him. Ten years later and another body is found with Bullock at the scene with Nigma there on hand. Meanwhile MCU are still investigating Gordon for killing Cobblepot who they do not realise is alive and well. The victim of the ‘copycat’ spirit of the goat killer is from a well off family with influence and the father seems slightly disturbed himself. Nigma is flirting with an archivist called Kristen kringle to look up on the killer whilst Cobblepot goes to see his mad mother and tells her he is going to be something big in Gotham. The new victim has something in it that all the other previous victims had, a coin sewn into the head that was never mentioned previously. Nigma is trying to help everyone but keeps getting pushed away and treated badly. He means well but is not liked. Alfred thinks Bruce is the next victim. Gordon sees a side to Bullock he didn’t know he had. The Goat killer strikes again and Nigma helps with a name. Gordon frees a victim and both catch the killer without killing him, taking back to headquarters for questioning. In Wayne manor, Selina Kyle breaks in and sees Bruce asleep by his crime scene files and steals something. Bullock and Gordon have their suspect in the station and the former is not convinced of him in any way. Barbara tells Gordon he is about to be arrested and he tells her he is willing to accept his fate for he is innocent whilst Bullock questions a hypnotherapist in relation to the killings, convinced something else is afoot. Bullock then shoots her after she tries to escape. Both Bullock and Gordon are arrested for Cobblepot’s murder at the GCPD when the man himself arrives much to the amazement of them all, especially Bullock who, fists flying, launches at Gordon. This episode was the darkest yet and it was originally meant to be the last of series one but it proved such a hit that Fox decided to extend the season and quite rightly so. The way it ended was quite a cliffhanger and thank god it is on next week otherwise I would go insane wondering what the hell will happen next although I have a sneaking suspicion that it could prove to be even more complex and grim than it is becoming. 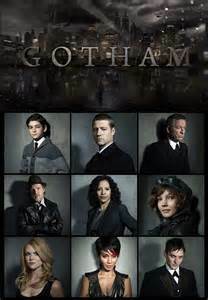 As ever, Robin Lord Taylor is stealing the show for me and many alike. Many are thinking that Kristen Kringle could be a link to Dr. Harleen Frances Quinzel better known as Harley Quinn. This could be quite possible. This was meant to be the last episode of the current season but it has now been extended to a full 22 episodes for the rest of the season. I for one am delighted but once again, as mentioned last week, the viewing figures over in America are dropping fast to a steady 6-7 million viewers. Hopefully it will last the full five seasons, even longer needed to tell so many intricate stories.